If you follow a lot of beauty Instagrammers, then you may have seen a rise in the face roller fad lately. Although this skincare tool dates back to ancient beauty regimens, they’ve become ultra trendy on social media in the past year. So what’s the deal? 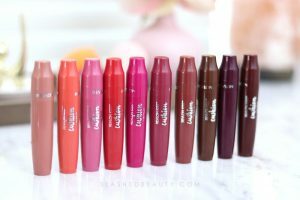 Do facial rollers work, or do they just make pretty flatlays? Face rolling isn’t any new skin care invention. Ancient rollers have even been spotted in museums dating back centuries, and have been popular in China as an anti-aging tool. To put it simply, using a face roller is an easy and gentle way to give yourself a face massage with extra benefits aside from relaxation. When done correctly, face rolling can help boost circulation, reduce fine lines, drain toxins for less of a puffy appearance, and tighten pores. All this can result in clearer, tighter and more radiant skin. So how does it work? What roller should you use? What results can you expect? 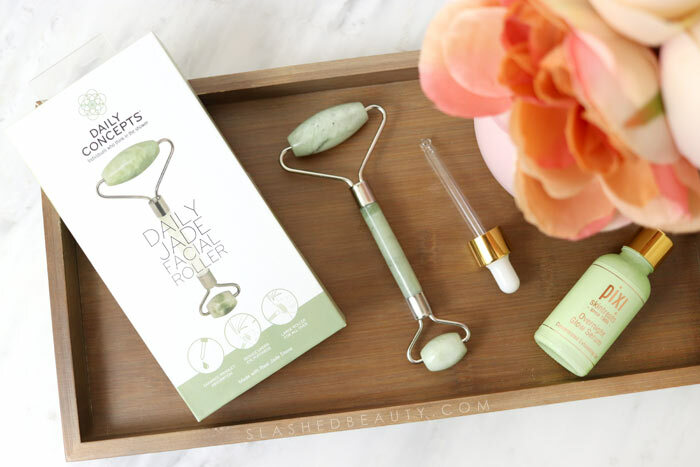 My go-to face roller is the Daily Concepts Daily Jade Facial Roller. Like most face rollers, there is a larger stone for areas like your neck, cheeks and forehead. On the other end is a smaller stone for the eye and lip area. It’s affordable, made with real jade, and has withstood daily use for several weeks in my routine. 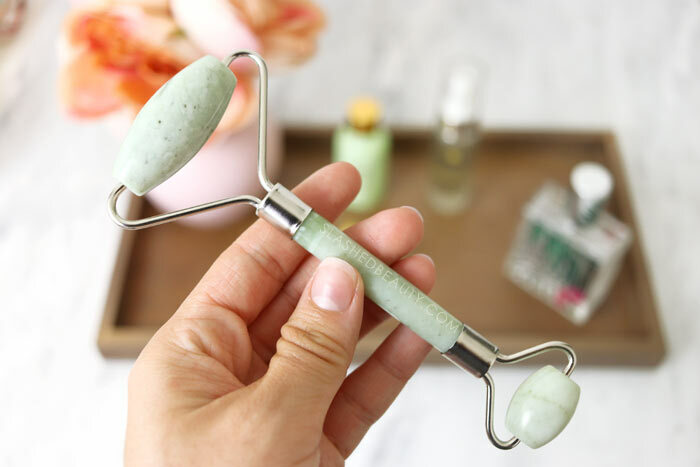 Does your face roller have to be Jade? Not necessarily. If you believe in crystal healing, then you may know jade is supposed to help bring harmony between the mind and body, promote relaxation and youthfulness. Aside from that, real Jade is naturally cool to the touch, even if it hasn’t been kept in the fridge. 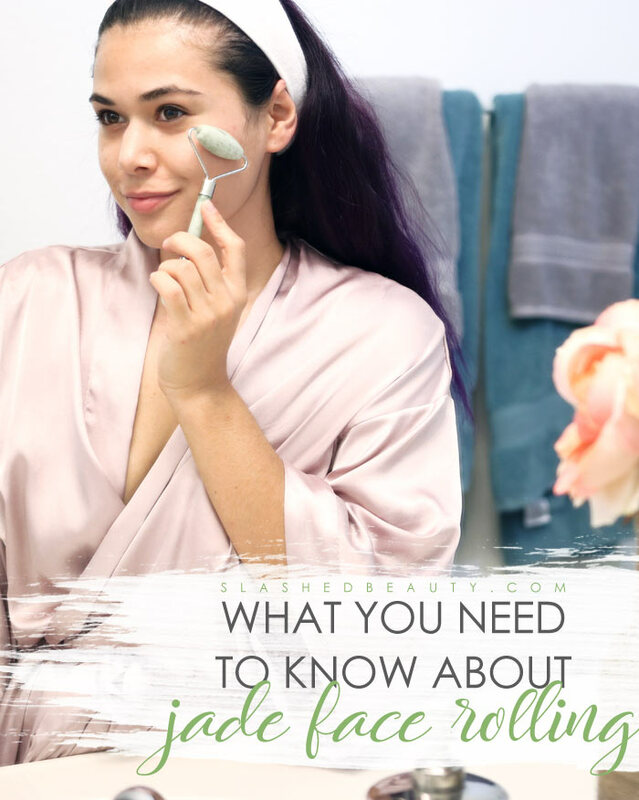 For these reasons, I prefer jade face rollers, though you can use any type of crystal— or even glass— for the massage benefits. Just beware that if you’re specifically looking for a jade face roller, you won’t find it for a few dollars. The really cheap ones are most likely colored glass trying to pass as real jade. Real jade ranges from an opaque milky appearance (like the one I have) to a deep clearer green depending on the quality and origin. You may have heard the term “lymphatic massage” in relation to face rollers. This is the practice of draining excess fluids and toxins from your face and neck area into specific drainage points so they can be expelled from your body. This will help you look and feel less puffy and dull. On your face, the drainage points are near your temples. On your neck, they are down near your collarbone. When massaging your face with a face roller, you should be rolling towards these points for the best results. On my face, I start low near my chin and roll over my cheeks toward my temples. The rule of thumb is to start near the middle of your face and work outward toward the drainage point. For my neck, I start high near the jawline and roll downward toward my collarbone. Roll over each area 3 times before moving onto your next one. You want to work in wide strokes all the way to the drainage point— not rolling back and forth. You also don’t need to press hard, just enough to feel the effect of the massage. Aside from draining toxins and fluids, which will help de-puff tired skin, face rolling also helps boost blood circulation which will accelerate absorption of your favorite skincare products. They’ll start working deeper into your skin for better results! 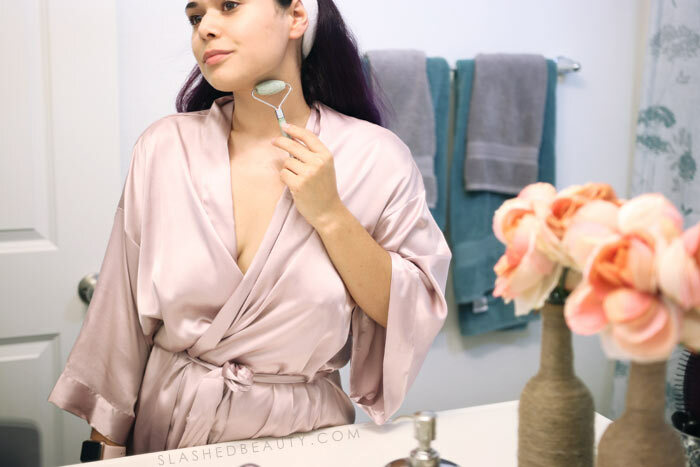 You can use your face roller on clean skin, but I like using it right after I’ve applied a serum or over a sheet mask to help the serum sink in. The first of two serums I’ve been using with the face roller comes from the same brand: the Daily Concepts Renewal Oil. It’s made with a blend of rosemary, lavender and eucalyptus that helps stimulate circulation and remove toxins, making it a perfect pairing with a lymphatic massage. 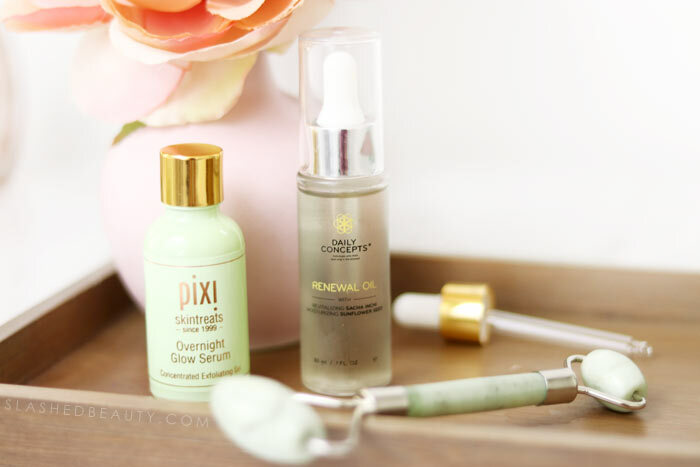 The other is the Pixi Overnight Glow Serum which is made with glycolic acid for exfoliation and boosting cell turnover, aloe vera for soothing, and cucumber for de-puffing. Because of the cooling effect of the jade stones, rolling can also help reduce the appearance of pores. However, it’s most used for contouring the skin and diminishing fine lines as the blood circulation amps up. You can also use a jade roller to help relieve sinus pressure when you’re feeling under the weather. Apply a warm cloth over your nose and cheekbones, then use the small roller starting on the center of your face down the sides of your nose and up toward your temples. This will help drain congestion. 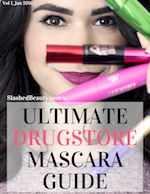 So, should face rolling be part of your daily beauty routine? Since I’ve incorporated it into my own, I feel like my skin has been looking more even (probably my products working better) as well as less puffiness in the morning in my eye and cheekbone area. Plus, it just feels good and helps me relieve tension I keep in my face. Rolling over my brows and temples is my favorite after a particularly long day. 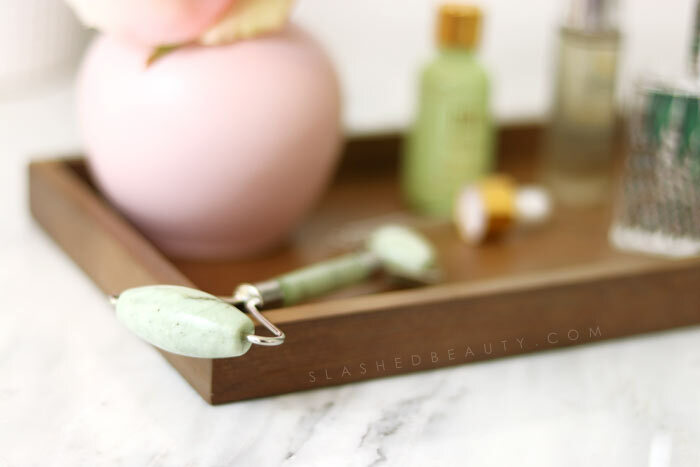 I think having a face roller on hand is great for self-care and skin care alike! You can find the Daily Concepts Daily Jade Facial Roller for $16 at Ulta Beauty. Have you tried using a face roller in your skin care routine? Previous articleWhat is Ibotta and How Does It Save You Money? I ordered a Jade roller off Amazon first time I used it, the cheap Chinese product that amazon is so well known for completely fell apart ! Then when I call Amazon customer service of course the operators all speak broken English only so annoying I hate amazon. Why people buy off there makes no sense to me what’s over! Yeah in this case I definitely recommend ordering from a trusted brand like Daily Concepts!